Brandy asked me if I would be interested in doing a guest post. I said I would love to since I love to try( yes I said try) to cook new stuff and I had just gotten a new cook book for Mothers day. I Live in AL and it is extremely hot in my kitchen that I usually cook with my crock pot, but this recipe sounded so good that I had to suffer through it. This recipe is from Audra Behling. Heat Olive oil in a dutch oven or large pot medium-high heat. Season Chicken with salt and pepper. Dust the chicken with flour. Add the chicken to the hot oil and brown on all sides. 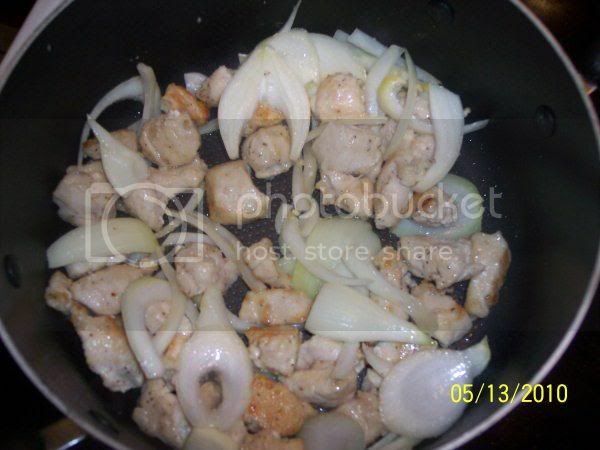 Add onion and cook for 3 to 4 minutes, or until softened. 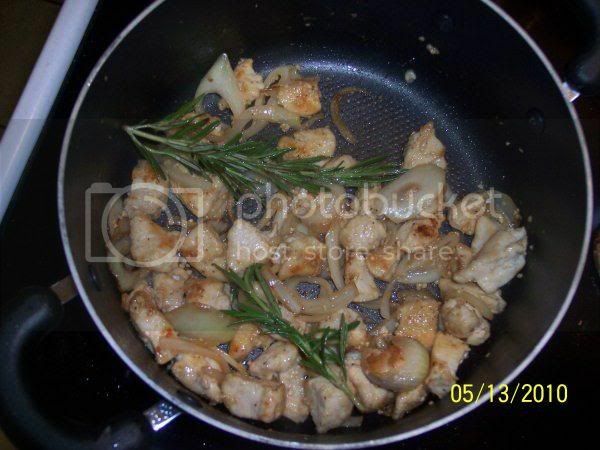 Add Garlic, thyme, and rosemary and cook for another 2 min. 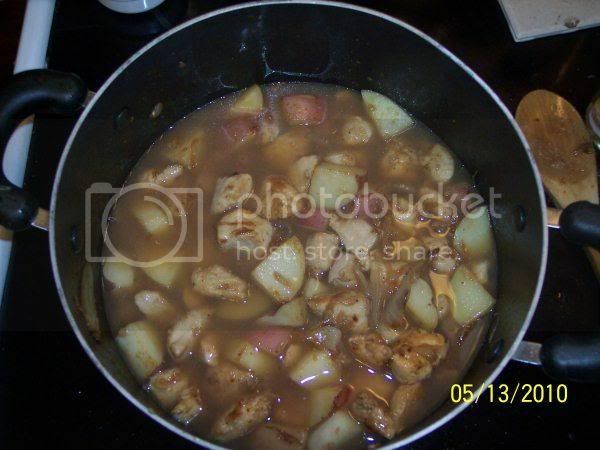 Add potatoes and cook till they start to brown. Add 1/3 Cup of Chicken stock and reduce for 2 min. Stir in the remaining chicken stock, and bring to a boil. Stir well, cover and reduce the heat to medium and simmer for 45 min, or until the chicken is cooked. While the chicken is cooking, combine butter and brown sugar in a skillet. 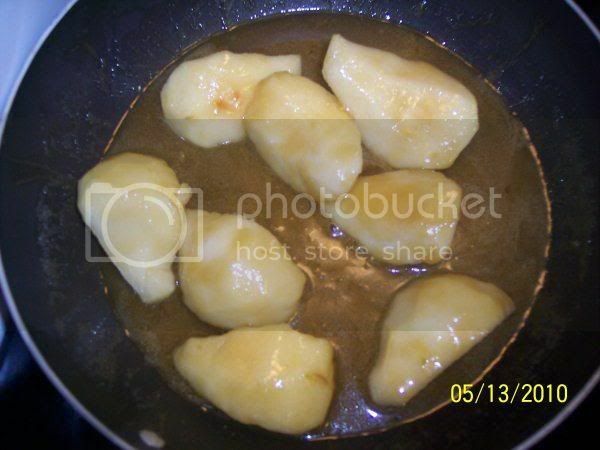 Place pears in the pan, increase the heat to medium high. Shake the pan to make sure all the pears are coated with the Glaze. Cook until the fruit is easily pierced with a knife. 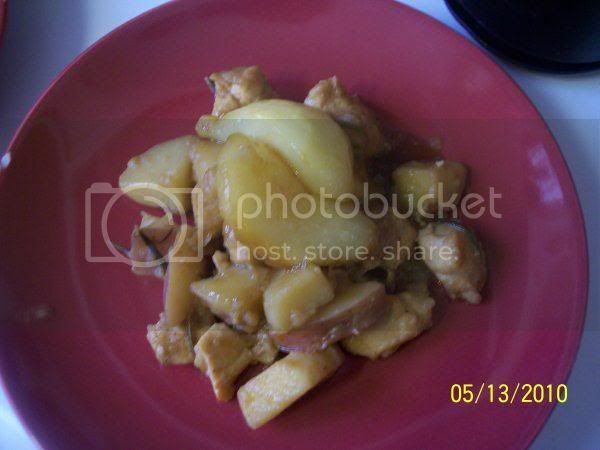 Serve chicken and potatoes with glazed pears on top. Makes 6-10 servings. I scaled this down to fit my families needs but I wish I wouldn't have after it was all over. I give this 5 spoons my husband gave it 4. He thought it was weird to have pears on top of his chicken, I think it gave it the extra umph that made it GREAT! This looks great! I love pears!